Blueprint magazine just keeps getting better and better, doesn't it? I wasn't so sure about it at first, but now I like it more than Martha Stewart Living. Someone handed me a copy of the July/August issue yesterday while I was wandering along the sidewalk hunting for a post office in the west village (Yeah, that kind of thing doesn't happen when I trudge to the nasty post office in my neighborhood, that's for sure), and it's crammed with page after page of great things. 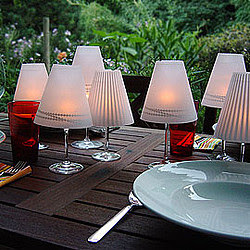 For example, I love these little parchment shades that transform a simple wineglass and votive candle into a cute tabletop lamp. But you know I won't be buying the pre-made printed versions. I'll be making my own. Sorry, lovely vendor. I'm thinking little eyelet cutouts on mine. You have to see decorations in the baby shower feature. Actually, my first thought was of Sally and her fabulous aesthetic. Oh, and I've been craving a Dry Meyer-lemon soda ever since I saw the photos. Brilliant ideas for using wall paper. Never thought I'd type that. Ever. Instructions for an easy-to-make fabric ball necklace. Have a great weekend! If the sun ever shows up, I'll be able to show you my new dress next time. man, i was really hoping to hate that magazine but it looks like it's too late for that now. I agree on the Blueprint love although this one wasn't my favorite one. You inspired me to make the fabric ball necklace today. I wrote about it this afternoon. Oh man! I agree!! Blueprint is one of my must have magazines when I hit the shop.